Back in February, we discussed an early Canadian issue of Paul McCartney’s Pipes of Peace album (click Just Pills Order Tramadol Online). That issue paired a Japan-for-U.S. CBS/Sony pressing with U.S. inserts. The barcodes on the inserts were covered with CBS-Canada distribution stickers, thereby denoting it a Canadian issue. We called it a Japan-for-Canada pressing for short. Here we consider on a companion piece, one that contrasts nicely with that Japan-for-Canada issue. It seems obvious that the Japan-for-Canada issue previously posted was the first CD of Pipes of Peace released in Canada. One might expect that a Canadian pressing (e.g., Cinram) would follow. Not in this case. The second Canadian issue is featured here. Let’s call it a U.S.-for-Canada issue. The second Canadian issue pairs a U.S. DADC pressing with Canadian inserts (actually customized for the Canadian market). Comparing the two releases, we see a clear sequence — the Japan-for-Canada issue matches the earlier disc with earlier inserts, while the U.S.-for-Canada issue matches the later disc with later inserts. The U.S.-for-Canada issue is still on the Columbia label and bears catalog number CK 39193, just like the Japan-for-Canada version. As an early U.S. DADC pressing, the disc has the text “Made in USA – Digital Audio Disc Corp.” stamped on the clear plastic ring. It also has “MADE IN U.S.A.” printed along the perimeter around 5 o’clock. The matrix code on the particular DADC disc considered here is “DIDP 20036 21A2”. For comparison, the matrix code on the Japan-for-Canada disc posted earlier is “DIDP-20036 21A2”. At first glance, it would seem that the two discs have the identical matrix code, meaning they were made from the same glass master. However, the Japanese disc has a hyphen in the matrix code, while the U.S. pressing lacks the hyphen. They are distinct pressings. As noted above, the second Canadian issue has customized Canadian inserts. The booklet and back insert are quite a bit different in appearance than the corresponding U.S. inserts. The Canadian inserts reference CBS Records Canada Ltd. in Don Mills, Ontario. Shown below are the cover, a spine label, and the back insert for the U.S.-for-Canada issue of Pipes of Peace, along with the U.S. DADC pressing. 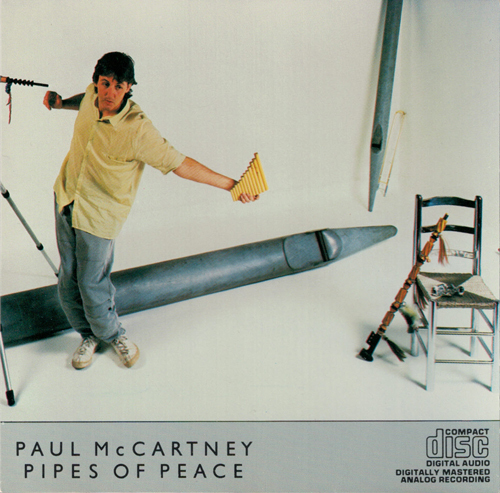 The cover for the U.S.-for-Canada issue of Paul McCartney Pipes of Peace (Columbia, catalog number CK 39149). This booklet was customized for the Canadian market and is therefore different than the booklet issued by Columbia in the U.S. The back insert for the U.S.-for-Canada issue of Paul McCartney Pipes of Peace (Columbia, catalog number CK 39149). Like the booklet above, the back insert was customized for the Canadian market and is different than the back insert issued by Columbia in the U.S. Note that “Distributed by CBS Records Canada Ltd.” is printed along bottom in English and French. The CBS Records address in Don Mills, Ontario is included. The catalog number is printed in the bottom right corner. Note the hyphen (CK-39193). The hyphen was unique to Canadian CBS inserts. 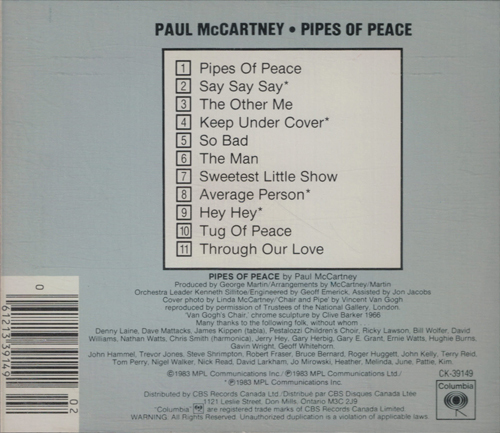 A spine label for the U.S.-for-Canada issue of Paul McCartney Pipes of Peace (Columbia, catalog number CK 39149). As with the back insert, a hyphen appears in the catalog number. The font is different than the one used by CBS for spine labels in the U.S. 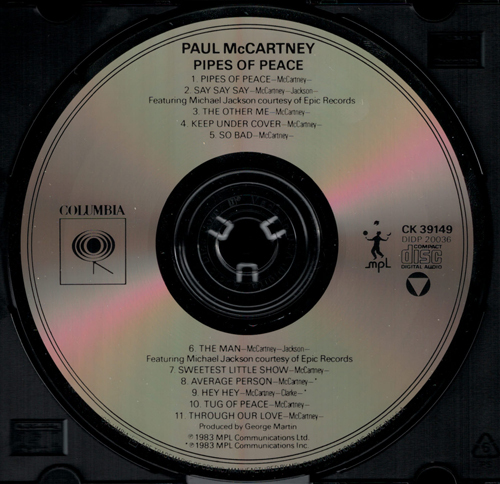 The U.S.-for-Canada pressing of Paul McCartney Pipes of Peace (Columbia, catalog number CK 39149). This same disc was issued in the U.S. and bears the U.S. catalog number. The disc has “Made in USA – Digital Audio Disc Corp.” stamped on the plastic ring, and the matrix code is “DIDP 20036 21A2”. It also has “MADE IN U.S.A.” printed along the perimeter. The “triangle-in-circle” symbol beneath the CD format logo at 3 o’clock was used by the DADC plant and does not appear on the earlier Japanese CBS/Sony pressing.